The government has given mobile operators six months to phase out airtime recharge cards as a response to the challenge of litter created by the airtime top-up option. According to a report in the Herald, this ultimatum was announced by the Minister of Environment, Water and Climate; Oppah Muchinguri-Kashiri. The minister has urged the mobile operators to come up with electronic recharge systems as alternatives for the recharge cards. It is part of a raft of new regulations that will also result in the banning of kaylite packaging which is used in the food industry, the introduction of a deposit on all beverage containers to encourage people to return bottles instead of dumping them and the introduction of fines and mandatory community service for criminal offenders. All three mobile operators, as well as other telecoms service providers such as Africom and TelOne, have relied on airtime vendors to distribute their recharge cards. This option has provided a cost effective alternative to not only sell airtime but also to create brand visibility for the operators. 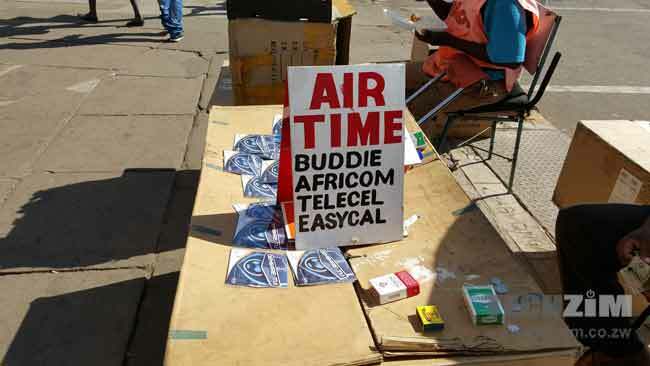 The biggest implication of this move, however, will be the loss of employment and income generation opportunities for the thousands of airtime vendors in Zimbabwe. In an economy where formal employment opportunities are limited, all forms of vending, including of airtime, have been taken on by thousands of Zimbabweans as an avenue to generate some form of an income. The government has at some point even considered taxing airtime vendors through a $1 a day levy after having realised the sizeable number of Zimbabweans turning to recharge cards as a form of livelihood. Is there any hope for the vendors? To ensure the survival of their businesses, the vendors will now have to change their distribution model to match the electronic requirements. The vendors biggest value proposition has always been ease of purchase and convenience, something that has helped them maintain relevance even in a market where mobile money airtime top-up options exist. As such they will have to find other ways of selling airtime that are almost as convenient as the recharge card model. Fortunately, there are ways of selling airtime via electronic top-up platforms that have been in the market for years but haven’t caught on versus the convenience of the recharge card. These include the electronic vendor alternatives from Easi and Hot Recharge, who have so far managed to provide their services to various retail outlets and to some vendors. There are also alternatives like Telecel’s e-Juice service which was introduced by the operator as an electronic option for selected airtime vendors. Telecel will now have to double down on this option, with other operators likely to explore the same route. is this even legal, plus the revenue losses for vendors, this is disastrous. Yah its true, its legit – TENGA. But don’t overpay. They will try charge you $65 but shop around. You should be able to find one for $45 somewhere. In SA they only cost R399. But note there is NO SPORTS CHANNEL and also no News channel. Its got the 3 SABC channels, ETV and some other ETV owned channels plus a few other random ones. And they are about 18 -actually 21 I think. But sports channel, there is nothing like that! Its about time… This is a great idea. Most people fear that vendors will lose business but remember all they need is gadgets and if these can be made around such technologies as NFC then we’ll have a better, cleaner distribution system. STARTUPs you have six months… lets get moving. opportunity, opportunity! Zimbabwe to become the worlds smartest country, irregardless of the economic impact on its citizens. Impoverishing people in the name of environment. How are operators going to sell airtym in Dotito, Magunje, Thuli, Nkayi, and all other remote areas in Zim. I do not see the difference between litter due to recharge cards and litter caused by receipts from supermarkets and stores. I thought the solution to litter was creating an effective waste management system. What about the vendors and their jobs? Okay fine but me i work outside town mumaruzevha apo at times im abt 39 km away from all roads and electricity poles how am i going to get airtime? no dont evem say ku sa or namibia cz last time i checked the median salary for civil servants is over 7000rand and less than 30% unemployment. all you need is a cellphone to sell airtime and a bag of change for your customers(or not if its from wallet to wallet), and just like the person who lives in your area boards to buy you more airtime cards they can board to fill up their phone with airtime to transact or even send someone to do it as they do with the physical juice card and its better coz the electronic airtime when juiced can work immediately whereas the juice card has to travel to you first in order to use it. The infrastructure already exists in my opinion, the condition is not yet quite right to execute this. This is yet another decision from another minister who is out of touch with reality, but very interested to show off her muscles. You claim to represent people bt all you bring is suffering to those who are trying to make a living legally out of the few opportunities left. Whilst at it, why not ban raw suwage from flowing in the roads, why not ban dongas in the roads. Instead of banning, why not build a vibrant recycling industry to consume the waste thereby creating more jobs for your people. I totally agree with you Macd, there a myriad of ways to deal with the making business and the environment better. Ko marara efodya ngavaiteiwo electronic cigars to those cigarette manufacturers. Scratch cards died when the mobile money option became a reality with the advent of Ecocash, Telecash, One wallet and the banks chipping in as well. I would like to think Econet slowed down on the aggressive campaign to use Ecocash for airtime (my thoughts )because the informal sector is a huge network which if they had cut off a couple of years ago would have left a lot of people stranded(and not because they got lazy, Mr Mboweni is on record saying that cash is the enemy they want to get of cash altogether). Remember buying airtime on Ecocash with 10 % discount and no scratching, i had no need to go to the guy at the corner except for loyalty and when i had no money in the bank to transact. We do have bigger problems with bottles and cans than we do scratch cards so i do believe that they are blowing a lot of hot air to make it look like they are actually doing something, why Telecomms first? why not Delta and other beverage makers Honourable Minister? that is the elephant in the room in terms of environment if i do say so myself. That was really my thinking! You have big polluting companies offloading dangerous chemicals into Mukuvisi river everyday, Delta, all cigarate companies etc. I bet my last dollar that of all telcos companies, only Econet will be forced to comply. I know it’s fashionable to worship Econet for some people, but not everything is about them. This affects an entire industry. Fundraising prettu sure macopmanies ari connected to the big leagues wont get fined even though they are guilty. So sorry econet and delta and pampers isai kamillion paside yemusana. There are limitless solutions to his issue. But at the moment, we have a gvt making noise noise about Zimasset and creating jobs for the people. Then you have ministers out of touch with reality, ministers who wonder why everyone is complaining about heat wave because they drive 4×4 fitted with air corn and cannt see potholes in the roads because again their luxury cars shield them away from that. Imagine how many people are going to loose their only source of income through that if it is going to be enforced? Recharge cards not going any where. She is dreaming and would have been fired by then. There goes my weekend project :-(. I was planning to make an Android app that does Optical Character Recognition of recharge cards so that you simply take a picture of the scratched recharge card instead of the tedious manual process. Kutsvaga relevance after being ordered to step aside for the First Lady and after having being overwhelmed my Higher & Tertiary Education. Focus on elephants, Oppah. You said there were powerful people implicated in the elephant poisoning poaching syndicate. You seem to have left out the names. Zanu kana maiisa pachinzvimbo inokumamirai. 3. Kuwedzera maTollGate pasina kana any Road Project inoitwa..Its not surprising to find a pothole paTollGate pacho. Most of them are nolonger functioning well. 4. Kuda kungoSHarer SHarer maInfrastructure pane zvavasina kushandira.